Linda had to go to the bakery today so she was up at 5:45 AM and out the door by 6:15. I was vaguely aware of the activity but fell back asleep and finally woke up a little before 8 AM. I skipped breakfast save for a glass of juice to wash down my vitamin and allergy pill. I spent time finishing yesterday’s blog post and thinking about what I absolutely had to get done in next four days. I was working at the dining room table instead of in the living room so I got to watch a Red squirrel dart back and forth across the deck all morning. It was gathering walnuts from the tree northeast of our house and taking them somewhere west of our upper deck. It would run (hop) across the deck with a giant walnut in its mouth and then return by way of the deck railing. While it was gathering another walnut I moved to our library where I had a good view of our lower deck. It came down the stairs from the upper deck and disappeared behind the grill. It may be storing them under the deck or under the cover on the grill, in which case we will have to move them. The main pieces of the desk set in place but not yet assembled or secured, and without the temporary plywood top or permanent Corian countertop. 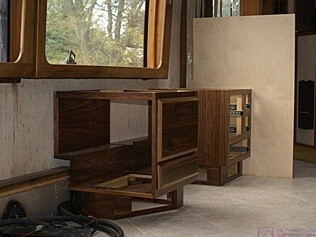 Once I was in the bus I continued pondering how to get the desk installed so that everything would line up. Built-in furniture is just that, and I had not spent a lot of time in advance figuring out how I was going to fasten pieces together and secure them to the coach. I retrieved the piece of 1/4″ Baltic birch plywood from the garage to use as a spacer at the right end and just slid it in place temporarily. I decided I would use mending plates attached to the back and underside of the left and right bases and pedestals to align the center cover. I also decided to use a length of angle against the wall to support and align the pedestals and cover. Along the same lines I decided to use smaller angle brackets to attach the vertical front panel of the built-in sofa to the two plenum/support boxes and the air return shelf, and to attach the plenum boxes and shelf to the HVAC/wiring chase. One of the original living room AC light fixtures. 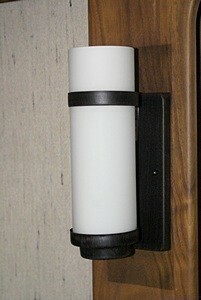 These were no doubt high-end fixtures but no longer worked in our remodeled interior. Feeling like I should get something tangible accomplished I decided to re-install the AC light fixture and the three DC reading lights under the overhead cabinets above the desk. Linda and I agreed last night that we needed to replace the three 120V AC light fixtures in the front of the coach so I turned my attention to that issue. I removed the fixture on the driver’s side by the kitchen end of the sofa alcove and removed the mounting ring. I also measured the size of the base and the overall size of the fixture and wrote them down. Ideally I will find a fixture that has a similar size base but with most of the light fixture above the center point. One of the problems with the current fixtures is that they hang down far enough that a person sitting on the sofa would bump them with their head and probably break them as they are made of glass rods. I headed towards The Home Depot in Howell and stopped at McDonald’s first for French fries and a soda beverage. I looked at all of their wall sconce light fixtures. They had two different ones that I thought might work but deferred a purchase until I had checked at Lowe’s. THD had 72″ piano (continuous) hinges, however, so I bought one. I also looked at PEX plumbing parts as Butch mentioned last night that I could use them to plumb the fan-coil heat exchangers. Lowe’s had a wall sconce that was a little more to my liking. I needed three but they only had one in stock, which I bought. The Associate checked inventory at other stores and indicated that there were two more in stock in New Hudson. He wrote down the Model number and the phone number for the store and said I could call and they would hold the items for me. I picked up a couple of 75W GE Reveal light bulbs, the mending plates, angle brackets, and two different pieces of aluminum angle while I was there. I looked for pieces of felt but all they had were very thick furniture pads which was not what I needed. The new living room light fixture. The color, style, and fit are a better match to the remodeled interior. I was going to stop at O’Reilly’s Auto Parts to check on heater hose, fittings, and band clamps but decided to skip that stop in favor of getting home and installing the new wall sconce light fixture. It installed without too much difficulty and I liked the look. The fixture, however, was rated for a maximum 60W bulb. I closed up the house and bus and drove to the Lowe’s in New Hudson. They did indeed have two more of the wall sconce light fixtures that I needed so I bought them. I also picked up three 60W (equivalent, 8.5W actual) 800 lumens dimmable LED warm white light bulbs. Linda texted me while I was at the store to let me know she was leaving the bakery and heading home. I stopped at Michael’s Arts and Crafts in Brighton and bought a 36″ x 36″ piece of walnut brown felt. I plan to use the felt underneath all of the pieces of the desk and sofa that contact the floor, and possibly in some other areas as well, to keep the wood from marring the tile. When I got home I called Elkhart Campground to make a reservation for the GLCC rally next week. I also called A-1 Upholstery in Elkhart, Indiana to check on our sofa cushions. Terry said they were almost done and we could pick them up on Monday. I then sent several text messages to Jarel with photos attached of the desk and sofa in place on the bus and indicated I had some questions and would call him later. I was getting ready to install the other two light fixtures when Linda got home. The timing was good as she got to see the first one and approve it before I installed the other two. We discussed the covering up of the mirror strips in the corner and decided we would leave them for now. We can cover them up later if desired. Linda went in the house to fix dinner. I got the second sconce installed and went inside. I had a few minutes until dinner was ready and used it to send an e-mail to Jarel. Dinner was couscous on power greens and small slices of bread from a baguette Linda bought the other day. I also had the leftover corn on the cob. After dinner I called Jarel. We had a long chat and it was 8 PM by the time we finished. 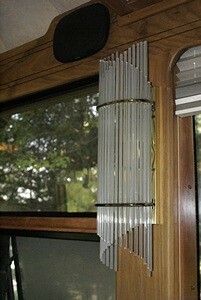 Linda headed to bed and I went back to the bus to install the third/final light fixture. I also installed four small frosted bulbs in the light fixture under the overhead cabinets above the desk, replacing the clear bulbs that were there. This light fixture is part of the same collection as the ones I removed from the living room walls but its design and location do interfere with anything. We might replace it someday, if we find something we like better for use over the desk that is the right size and shape, but for now it will remain in place. I locked up the bus, closed up the garage, and headed to my office. I dealt with some BCM-related e-mail and then off-loaded today’s photos from the Sony a-100 DSLR. I went through all of the photos from September, selected about a dozen, and processed them into 300×200 pixel size images so I could share them with friends and family via e-mail. I have written extensive blog posts everyday but last posted to the website in mid-July. I don’t like being that far behind but getting the posts uploaded is just not as important as other things I have to do at this time. I was heading to bed when I decided to replace the two light bulbs in our home kitchen that were burned out. I had the two 75W GE Reveal bulbs that I could not use in the bus, so I installed them in the kitchen downlights, and that really brightened things up. I got to bed just before midnight. It had been a beautiful day, weather wise, and a cool night was in store portending good sleep. But first I had to capture the details of today’s work for this post. This entry was posted in Accounting, Bus Projects, Professional, RV-Travel, WFPB and tagged 120V AC light fixtures (H3-40), A-1 Upholstery (Elkhart IN), alignment plates (desk), backyard wildlife, BCM, built-in sofa (H3-40), corn-on-the-cob (WFPB), couscous & power greens (WFPB), custom walnut desk (H3-40), desk installation (H3-40), Elkhart CG (Elkhart IN), interior remodel (H3-40), Jarel Beatty Cabinetry (Logansport IN), Lowe's (New Hudson MI), Lowes (Howell MI), Metropolitan Baking Co, Michael's Arts & Crafts (Brighton MI), piano hinge (built-in sofa), Reveal dimmable LED bulbs (GE), Surplus & Salvage Rally (GLCC), The Home Depot (Howell MI), wall sconce (H3-40), walnut brown felt (Michael's) on 2015/09/10 by BRF. Linda was up at 5:45 AM. Hey, it’s just a number. I mean, who needs daylight? She quietly got dressed and slipped out of the house to drive to the bakery. This is how it’s going to be on days when she has to be physically present at the facility. Unless I am away working on the bus. In that case she probably does not worry about being quiet. I got up around 7 AM and had a nice breakfast of homemade granola, orange/grapefruit juice, and coffee and then spent some time catching up on blogs that I follow. Keith showed up around 9:30 AM to cut the grass. Butch had called last night to ask Linda a question and asked that I call him when I had a chance. Our company did not leave until after 9 PM last night, which was great, but too late to call Butch back so I called him this morning around 10:30 AM. Butch had used a stop leak additive product to try to plug a leak in his Aqua-Hot main coolant loop but it did not work. The Aqua-Hot is a Webasto-based diesel-fired hydronic heating system. Rather than repair the Aqua-Hot, or replace it with another one, he decided to order an Oasis Combi unit from International Thermal Research. The Combi has a lower BTU rating than the Aqua-Hot but is smaller, simpler, and uses stainless steel for some of the components. It should be more than adequate for their bus, which is very well insulated, and give them years of trouble free service. Butch and Fonda’s Aqua-Hot is a very similar model to ours and I will probably buy it from them as a source of spare parts. His burner is fully functional, which ours is not at the moment, and the short term fix for our unit may be to just swap the burners. I can then repair the defective burner at my leisure and have it available to swap back should the replacement ever develop a problem. As a result of our conversation I decided that I will take our bus to their place tomorrow, leaving around noon and arriving between 4:30 and 5:00 PM. In preparation for that trip I needed to gather up and organize parts, materials, and documentation for my initial set of projects. I also needed to do laundry and select clothes for the trip. I may also need to do some grocery shopping this evening unless Linda already has food in the house that I can take. Tuesday morning I will have to load clothes and toiletries, hook up the car, check and adjust tire pressures, load computers and other last minute items, and get the bus ready for travel. My main focus for Wed, Thu, and Fri will be the Aqua-Hot (no burn and leaky exhaust). If we have time I would also like to finish installing the Zena 24 VDC power generating system and get it operational. I will return on Friday afternoon/evening in the car as Butch and Fonda have plans for the weekend and I still have lots of things to take care of back at the house. Keith finished up with the lawn a little before noon. He will be back at least two more times, once in mid-October and again towards the end of the month. Whether he cuts the grass in November or calls it quits for the season will depend on the weather between now and then. His basic grass mowing season is April 1 through October 31 and he has his business insured for that range of dates, but he said he would come back in November if needed. The grass should be dormant by then, but there may be a few leaves that still need to be mulched. There could also be a foot of snow on the ground, so it will all depend on the conditions prevailing at the time. During the mowing season he spends the work week living at their trailer/cabin at Haas Lake RV Park, which maybe 20 miles from our house, but by November 1 he is looking to move himself and his equipment back home to Milan for the winter. Milan is at least 60 miles from our house, maybe a bit farther. I spent a little time at my desk and decided to re-install WordPress 4.0 on the SLAARC, FMCA Freethinker, and FMCA Great Lakes Converted Coaches websites. I re-installed it a couple of days ago on this (our personal) website, but I have not tried creating or editing image galleries since then so I do not know if the broken drag-n-drop feature has magically been repaired or not. I suspect not, but Linda says I’m a pessimist. I had a quick bite of lunch and then read a few more blog entries while I waited upstairs for Brandon from Bratcher Electric to show up and convert the whole house generator from propane to natural gas and do the annual maintenance and multi-point inspection. He arrived at 2:15 PM and was here for about an hour. I had him show me how to disable the generator as it has to be turned off anytime I want to shut off the power coming into the main distribution panel in the basement. He did not have the correct length of flexible gas line and will come back on Friday to do the LP to NG conversion. Besides disconnecting the propane and connecting the natural gas the conversion involves attaching two wires to a pair of corresponding terminals on the gas valve inside the unit and changing a setting in the controller. While Brandon was working on the generator I started gathering things from the garage that I needed for tomorrow and loading them in the car and the bus. We already have quite a few things staged to take to the Surplus and Salvage Rally next week, but I will take those things with me when I return to Butch and Fonda’s early next week. Linda called at 4:35 PM to let me know she was on the way home. I drained the water out of the fresh water tank on the bus as it had been sitting in there since June. (Yuck.) The fresh water hoses needed to be cleaned before I used them so I filled their storage tub half full of softened water and added some bleach. I coiled them up, hooked the ends together, let them soak for a while, and then wiped them off with clean paper shop towels. Much better looking, and probably and lot more sanitary. Linda got home at 5:30 PM, a very quick trip for that time of day. Butch had called just as she was getting home to let me know that he had spoken to someone who has two RV spots in Quartzite we can rent for a very reasonable price this winter. Linda and I need to discuss it, and would like a few more details, but that probably makes more sense than trying to boondock our first time out there, especially as we do not yet have solar panel on the roof of our coach. Linda made a nice green salad and heated up some of the lasagna from yesterday. Italian bread with garlic “butter” and a glass of the 2009 Egri Merlot completed the meal. We talked about our respective days, reminiscent of when we both worked outside the home. After dinner I finished cleaning the fresh water hoses, filled the fresh water tank, and then drained and stored the hoses. While I did that Linda gathered food items, bedding, and towels and put them aboard the bus. It will still take me a few hours to get ready to leave tomorrow, but I should not be rushed getting everything done. Linda heated up some of the apple/pear crisp for dessert after which we sat on the sofa and looked at highway maps on her iPad. The map app on the iPad said the trip from our house to Quartzite, Arizona was about 2,100 miles and would take “1 day, 9 hours.” That’s non-stop, of course; i.e., 24 + 9 = 33 driving hours. That time works out to just under 64 MPH. I typically drive the bus at 60 to 63 MPH on Interstate highways, but we do all of our trip planning based on 50 MPH. That usually works out well at taking into account for fuel stops, rest stops, and non-Interstate roads. This means our travel time will be more like 42 hours. Our preference is to only travel 200 to 300 miles per day, or 4 to 6 hours a day, so the actual number of travel days will be between 10 and 7. We like to spend more than one night at each stop, depending on what there is to see and do in the area, so the number of days it will take us to get to Quartzite will 2 to 3 times the number of driving days. A lot of the details of our trip will be last minute decisions based on weather, but our “plan” is to leave December 1st and arrive in Quartzite by December 21st, more or less. This entry was posted in Accounting, Arizona, Bus Projects, Computers, Family-Friends-Home, Professional, RV-Travel, WordPress and tagged 2009 Egri Merlot, Aqua Hot, Bratcher Electric, Butch & Fonda, FTH-WP, GLCC-WP, Haas Lake RV Park (MI), homemade granola (WFPB), hydronic heating system, Keith Kish Lawn Care, lasagna (vegan), LPG to NG conversion, Metropolitan Baking Co, Oasis Combia (ITR), Oasis hydronic diesel furnace (ITR), Quartzite (AZ), SLAARC-WP, Surplus & Salvage Rally (GLCC), Webasto, whole house generator, WordPress 4.0, WP 4.0 drag-n-drop on 2014/09/29 by BRF. After I installed iOS8 on my iPad2 yesterday morning my Logitech Bluetooth keyboard seemed to change its behavior, giving me double letters in some cases and feeling a little sluggish in its response. The keyboard itself has not changed, so I presume this has something to do with iOS8. I also presume the keyboard batteries have not run down already, but I suppose that is a possibility. If so, I will be replacing them once a week. While creating an image gallery for the SLAARC WordPress website last night I noticed that the drag and drop feature of the gallery editor did not work. I upgraded to WP Version 4.0 about a week ago but this was the first time I had tried to use the gallery feature. If there is a problem with this feature there is no way that I am the first person to discover it and I presume WordPress is aware of it. I find it strange, however, that they have not released a maintenance update fixing it since an improved and more visual editor was a major feature of the 4.0 release. A few weeks back I re-established contact through Linked-In with a colleague from 10 years ago. Jim was Director of General Education Services at Livingston Educational Service Agency at the time and we went through NCA Ambassador training together. It turns out that he lives and works in the Brighton area, so we are now neighbors of sorts. He suggested we meet up for coffee and I finally called him this morning to arrange that. We both had time at 1:30 PM today and agreed to meet at the Panera on Grand River Avenue by I-96 at that time. Linda got the new Global Bake bakery software installed on her laptop yesterday so this morning she was able to start working on the software conversion process in earnest. Her work requires a lot of concentration, and she gets very focused when doing it, so I went to my office to continue working on editing blog posts and photos. In checking my e-mail I noticed that I was still getting failed login attempts from foreign countries on this site and on the FMCA GLCC website, which is sub-domain of this site, in spite having installed the premium (paid) version of the Wordfence Security plug-in. I looked at the installed plug-ins for the GLCC website and discovered that I had one named “Limit Login Attempts” that I did not have installed on our personal website or the other two sites I manage. I surmised that this plug-in might be doing just what the name implied and in the process preempting Wordfence from ever doing its job. I deactivated it and saw a reduction in failed attempts, with none from outside North America, suggesting that the country blocking feature of Wordfence was now working properly. I saw a similar drop in failed login attempts on our personal website when I activated the country blocking feature for all countries except the U.S., Canada, and Mexico. Only time will tell, however, if Wordfence is indeed blocking login attempts from outside North America. We had hummus and apples for lunch after which I hung up one load of laundry and put another load in the washer. I left at 1 PM to have time to stop at Best Buy to get something to clean our various touch screens and monitors. Traffic was very heavy in the I-96 and Grand River Avenue shopping area, but Best Buy is in the same shopping complex as the Panera, so I made it there on time. Jim and I talked for almost two hours and which covered the highlights of the last eight years. Back home I kept my focus on getting the blog caught up. Linda wrapped up her work for the day and we finished the bottle of Alpha Rose from Red Trail Vineyards while she fixed a simple but tasty dinner of vegan burgers and corn. I got a call from Butch letting me know that the company in Nevada had arranged for a semi and taken all of the parts they plan to take. Everything that is left is Butch and Fonda’s to do with as they please. The important thing for us is that I can now take our bus down there at my convenience. I would like to get all of the natural gas related work taken care of and put the finishing touches on the garage project before I move the bus, but I may go ahead and move it next week if the scheduling of contractors works out. During the evening I had an exchange of TXT messages with Chuck. He had ordered some miniature 24VDC light bulbs (1829s) that are used in our bus dashboards and the order had arrived. Rather than go to his shop after breakfast tomorrow we arranged to meet him for dinner tomorrow night. I also got a call from Michele Henry of Phoenix Paint. She had a new customer who just bought a mid-1990’s Prevost XL converted coach and she gave him my name and phone numbers in case he had any questions about the rig. We agreed that we would try to find time during the GLCC Surplus and Salvage a Rally to work on the article I started last year about the process she used to repair the body and roof of our coach, seal and coat the roof, and paint the body. We capped off the evening with the second to last episode of Season 5 of Doc Martin. We need to return the DVDs to the Howell Library on Sunday, so we want to make sure we get through all of the episodes for Season 5. This entry was posted in Accounting, Computers, Education, Family-Friends-Home, FMCA, GLCC, Ham Radio, Professional, Projects, RV-Travel and tagged Alpha Rose wine (RTV), Apple iOS8 (iPad), Butch & Fonda, Chuck Spera, Doc Martin (PBS), FMCA GLCC Ch, GLCC-WP, Global Bake software, hummus, James Reese (Brighton), Michele Henry (Phoenix Paint), Panera (Brighton MI), Surplus & Salvage Rally (GLCC), Wordfence Security WP plug-in, WordPress 4.0 on 2014/09/19 by BRF. After breakfast Linda downloaded the Hanks Writer to her iPad2 while I downloaded three app updates to mine. After checking in on the blogs that I follow, I spread some grass seed around the bare and thin spots in the back and west side of the yard by the house. I wanted to take care of that while it was cool and the ground was still damp with dew from the overnight lows in the upper 50’s. Darryll did not call last night, so I did not expect him to be here today. Our son might be interested in the old window air-conditioner so we moved it to the southeast corner of the garage and plugged it in to make sure it worked. It did, so I sent him a text message to that effect. We cleared off the table we have been using to cut drywall and got the 1/4″ birch plywood panel that will be the front of the box that encloses the electrical sub-panel and cables. We measured carefully, twice, laid out the cut lines, and checked the measurements again. We got the center cutout very close to correct on the first try and only had to trim it a little bit in one corner to get it to fit around the panel box. We did not secure it place as we still need to feed the thermostat cable through the wall and put some insulation in the wall cavity to the left of the panel as this is an outside wall. With the carpentry work done we started cleaning and reorganizing the garage, making sure that Darryll will still have access to things he needs to work on. We plan to have the storage pod picked up on the 12th or 13th, so even though Darryll is not quite finished, we were anxious to start working on the rest of the garage. We moved the tools and supplies we’ve been using to the three new shelving units on the east wall of the garage. We then unloaded two shorter units and two tall units on the west wall and spread everything out on the floor. We moved the units to the northeast wall, the shorter ones fitting nicely under the low end of the flue where it exits the utility closet wall. We went through the stuff on the floor and put some of it in the trash, set some of it aside to recycle, designated a few things to go to the Salvation Army, collected RV parts in boxes to take to the GLCC Surplus and Salvage rally next month, and put the rest back on the shelves. We took a break for lunch and then finished up in the garage for the day. Linda worked at her desk and I changed out of my construction clothes into something more suitable for working at my desk. She made marinated baked tofu cubes for dinner, with sautéed green beans and corn-on-the-cob (organic and non-GMO, of course). We sat on the deck and watched our resident American Red Squirrel gather pine cones and move them under the cluster of three big fir trees where we presume it has a nest and pine cone midden. These trees have never been trimmed and the lower branches are sizable and long and the ends rest on the ground. I peeked in there the other day but did not see pine cones piled around any of the trunks like I expected, so I’m not sure where the midden is located. I was up later than I should have been but I finished reading Big Lake Scandal. The fifth book in Nick Russell’s Big Lake murder mystery series, it was a good read. Nick has created an interesting place with interesting characters and reveals a little more about them with each volume. He is particularly good at capturing the way people might actually talk to one another on a daily basis in a small western town. He should know; he has spent a lot of time in such places over the years. This entry was posted in Computers, Family-Friends-Home, Projects, WFPB and tagged American Red Squirrel, baked tofu cubs (vegan), Big Lake Scandal (Nick Russell), corn-on-the-cob, desk work, garage cleaning, garage project, grass seed, Hanks Writer (iPad), midden, non-GMO, pine cones, plastic shelves, Salvation Army resale store (Howell), sauteed green beans (vegan), sub-panel enclosure, Surplus & Salvage Rally (GLCC), utility closet, window a-c on 2014/09/03 by BRF.